A tiny tree frog seems to be using city drains to amplify its serenades to attract females. 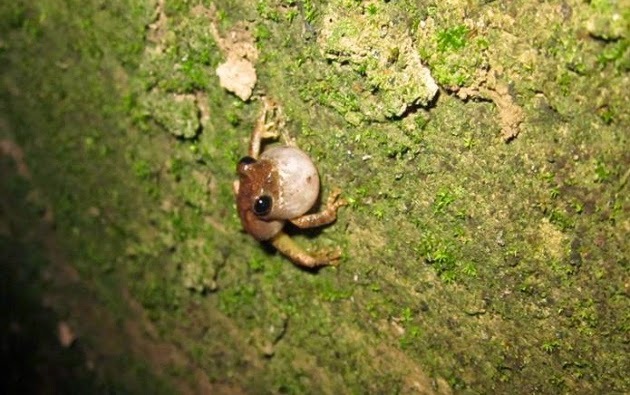 In research published1 today in the Journal of Zoology, researchers found that the Mientien tree frog native to Taiwan congregates in roadside storm drains during the mating season. Frogs' ability to amplify their voices is a known phenomenon. In 2002, researchers showed2 that male Metaphrynella sundana frogs in Borneo use hollow tree cavities in their natural habitats to boost the volume of their calls. The researchers randomly established 11 plots of 10 metres long and 0.5 metres wide within the drains, and adjacent 10-metre-wide sections of land outside the gutters for monitoring after dark when the frogs sing their mating songs. They found that the frogs selected storm drains for mating calls much more often than they did the other locations — on average, 1.64 male frogs per square metre, or just over 7 per site, were found inside the drains, and only 0.02 males per square metre, or almost 2 per site, outside.